(It seems the image above was not showing for a while, so I re-posted it… must have had something to do with the ghostly light). One evening as the sun set, looking up into the sky there appeared a rainbow from the refracted light. The eerie glow stayed in one spot for several minutes and in that time a passenger plane flew directly through it, at least from my angle. 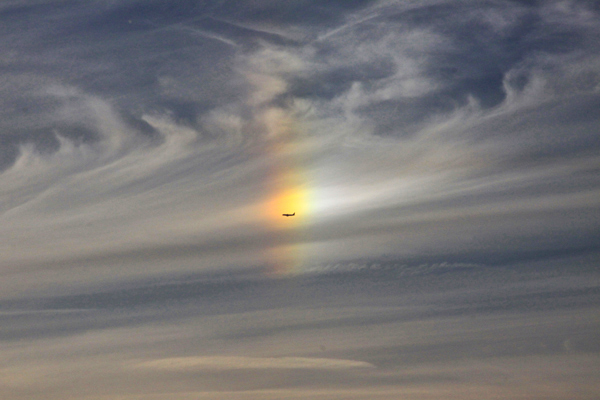 I captured the image just as the plane flew through the rainbow (no Photoshop here). I wonder what the scene must have looked like…from inside the plane. Contract Risk Assessment Surveys provide several benefits that mitigate risks and increase performance across organizations:. believe that a startup company can win federal contracting opportunities, but it is true. In most cases, the freelancer is an expert in a field that is outside of the hiring company’s field of expertise.